One of the world’s greatest living inventors is to be celebrated with a set of six postage stamps issued by the Isle of Man Post Office (https://www.iompost.com/stamps-coins/collection/invention-and-innovation-dr-john-c-taylor-obe/), focusing on different areas of his life’s work. Dr John C Taylor OBE (http://www.johnctaylor.com/), 80, who was born in Buxton, Derbyshire and has lived in the Isle of Man for the greater part of his life, spent his career creating safety-critical electrical components and switches that are vital to many pieces of technology we use today, most notably the kettle controls that switch our kettles off when they have boiled, and the 360° cordless kettle. Dr Taylor has over 400 patents to his name. He has also invented temperature and current-sensitive safety controls used in small electric motors utilised in a wide range of appliances and cars. He also created the iconic Chronophage clock series, the most famous of which is the Corpus Chronophage at Corpus Christi College, Cambridge, which has become the most popular attraction in the city. 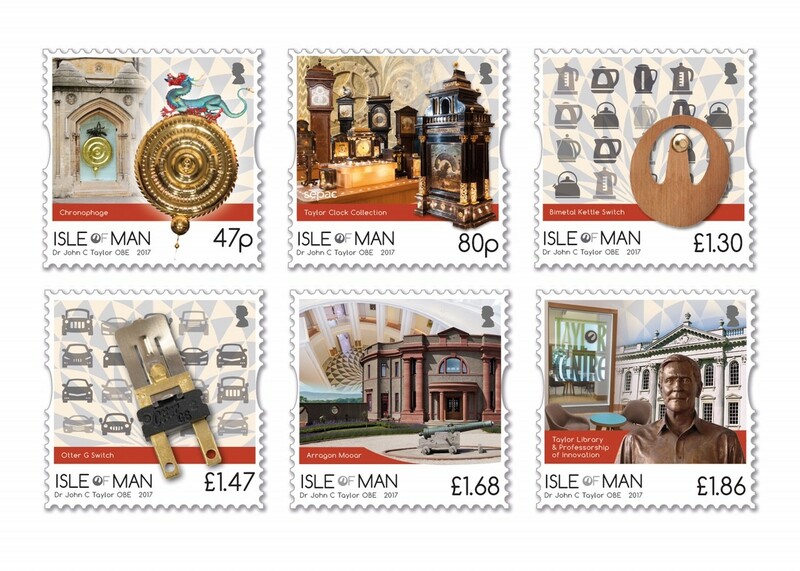 The Isle of Man Post Office has created six stamps, ranging in value from 47p to £1.86, focusing on Dr Taylor’s inventions, love of horology, philanthropy and home – the elliptical shape of which inspired the island’s post office to create their first stamps with elliptical perforations. The intricate design of the stamps combines stunning photography and high-quality printing, with a varnish and metallic ink finish. The stamps are to be on sale now. Dr John C Taylor OBE said, “I’m delighted by the creativity shown by the Isle of Man Post Office, who have captured my life story in a colourful and imaginative way. In 2008, a donation making possible the building of the new Taylor Library at Corpus Christi College, Cambridge, followed by the gift of the Corpus Chronophage Clock that has become the main visitor attraction of Cambridge. In 2015, he became the main sponsor of the new Dr John C Taylor Enterprise Hub, otherwise known as the Taylor Centre, in the Royal Academy of Engineering, London. In 2017, the establishment in perpetuity of the Dr John C Taylor Professorship of Innovation in the Engineering Department of Cambridge University. All funds received by Dr Taylor from the sale of the stamp issue will be donated to the Teapot Trust, which works with chronically ill children in hospitals and hospices. It was established in 2010 to build resilience in children with chronic illness by encouraging them to express emotions, mentally overcome the challenges linked to their condition and develop healthy coping mechanisms. Participating in art therapy can contribute to positive mental health, provide peer interaction and a sense of community for youngsters within the hospital environment. Find out more or pre-order the stamps here (https://www.iompost.com/stamps-coins/collection/invention-and-innovation-dr-john-c-taylor-obe/). Dr John C Taylor OBE was born in Buxton in Derbyshire in 1936. Having spent six years living in Canada during his childhood, he returned home towards the end of the Second World War and attended King William’s College on the Isle of Man before studying Natural Sciences at the University of Cambridge. As well as being one of the world’s most prolific inventors, Dr Taylor has also conducted a lot of research into the subject of horology. He is one of the world’s leading experts in the work of John Harrison, an early pioneer of timekeeping and sea clocks. This led him to design and help build the Corpus Chronophage, a three-metre-high clock that is displayed in an exterior wall of the Corpus Christi College building at the University of Cambridge.